What characterizes spring for you? The sweet anticipation of a bud blooming? A heavy floral fragrance evoked by a sun-soaked breeze? With the heat of the day warming the morning dew that much quicker, Foley’s subtropical climate begins producing an abundance of flowers early in the year. From the winter camellias to the early spring azaleas, there is always a bloom nearby in downtown Foley. Even the trees are dripping in blossoms as the magnolias start to show their impressive crowns. April is one of the best times of year to visit Foley, and it happens to be Garden Month as well. 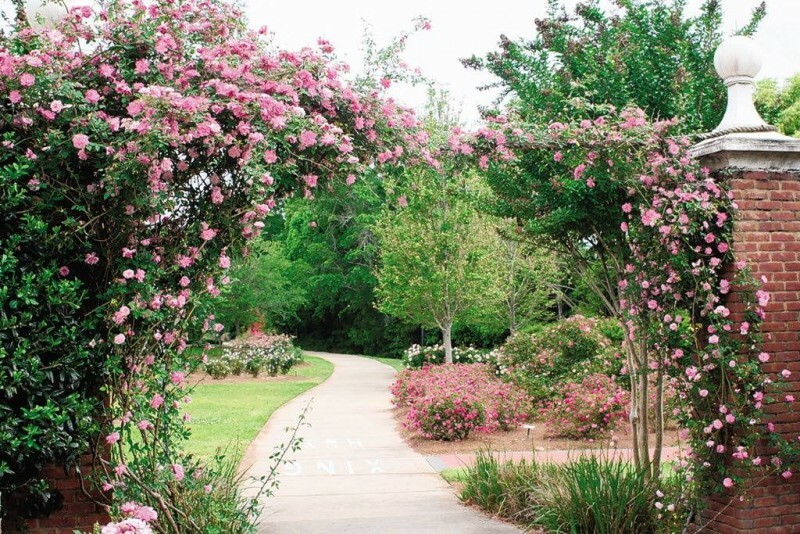 What better way to celebrate the small-town Southern charm of this Community of Excellence than a stroll down the Wilbourne Antique Rose Trail? This non-looped trail winds for about a mile and allows opportunities for wildlife observation, biking, or walking your leashed dog. Each heritage rose is identified by name and its propagation date; the trail was planted in chronological order. These hardy and disease-resistant plants thrive in the subtropical weather here. Follow the trail as it passes by the Depot Museum, Heritage Park, and John B. Foley Park. The trail begins at the northern edge of Foley’s Heritage Park, near the pavilion and 125 E. Violet Avenue, then runs north to Section Street. A second, more Southern section of the trail starts near 125 W. Orange Avenue and runs south to Myrtle Avenue. The trail is open daylight to dusk, 365 days a year, and there is no charge for admission. April is by far the best time to visit Foley’s colorful rose trail, and with April being Garden Month, we hope you set aside some time to visit this beautiful and historic addition to our charming town. Stop and smell the roses just a block east of Hwy. 59. There’s always time for the hustle and bustle, so step away to spend a quiet night or two in Foley, Alabama, and an even quieter day among the sweet blooms of spring.